Coming into the season, we heard a lot of talk about how the defense was going to show multiple fronts capable of confusing quarterbacks. The results have been... uninspiring. But against Illinois, with Greg Robinson's back against a wall, he finally started to show some of the things that the defense promised before the season began. Part of this is because Michigan was daring Nathan Scheelhaase to throw the ball, about more which later, but Michigan's defense looked like a completely different unit against Illinois than they have all year. On one third-and-short early in the game, Michigan disguised their defensive coverage in an attempt to bait Scheelhaase into a bad throw while staying fundamentally sound and forcing an Illinois punt. Michigan is in the wildly effective 3-4 over that they had shown for most of the game. Cam Gordon is rolled up to the line of scrimmage at the top of the screen. Michigan has its corners and safeties all off the line of scrimmage. 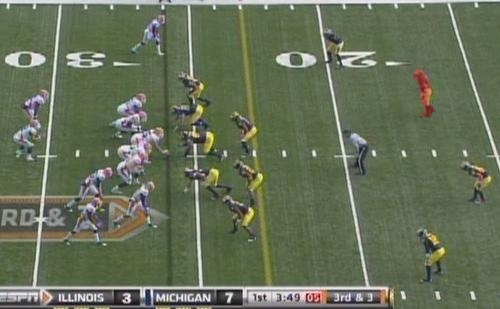 I believe Michigan is showing a cover-2 look pre-snap. The person to watch is Jordan Kovacs (in red). Illinois has a bunch receiver set with a split receiver to the other side of the field and Jason Ford in the backfield next to Scheelhaase. 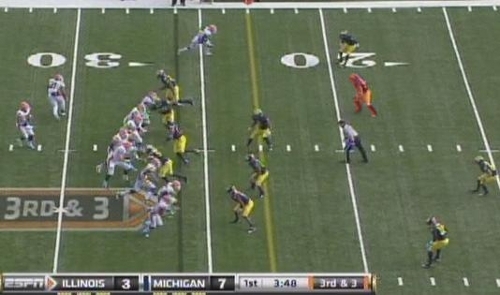 After the snap Michigan rushes their three down linemen as well as Gordon who had walked up to the line of scrimmage. Kovacs has continued to come down the field from the safety position he showed before the snap. Michigan's corners and Ray Vinopal will drop into cover-3. Illinois is running the snag route with the x-receiver (top of the screen) running a hitch and Ford running a flare out of the backfield. Kovacs' zone is in red. 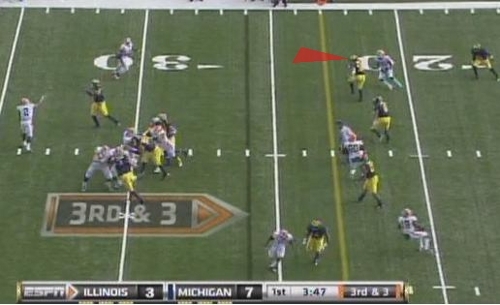 As the x-receiver starts to turn his shoulders on the hitch route, Kovacs is undercutting him. If Scheelhaase throws here, which he might--this is his first read--Kovacs has a sure interception. Gordon is coming unblocked off the edge forcing a quick throw from Scheelhaase. Meanwhile, Michigan's linebackers are playing underneath zones and sorting out the bunch formation Illinois is running. Scheelhaase either has to throw or take a sack from Gordon who is still untouched. 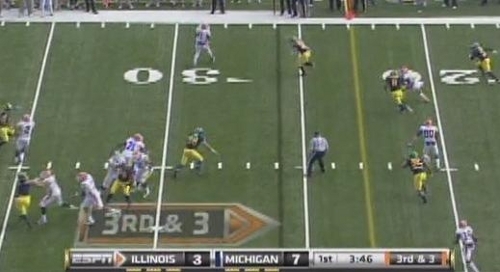 Kovacs is in perfect position and has come directly under the x-receiver. He also has his eyes in the backfield and can see Ford running the flare route into the flat. He'll get a good break on the play and have a chance to make a tackle for loss. Ford catches the ball behind the line of scrimmage and turns upfield. Kovacs is heading directly downfield at him with a chance to make the tackle. He'll eventually whiff, but Ford will be wrapped up by rallying Michigan defenders short of the first down marker and because Kovacs was able to slow him down. One of the reasons Michigan succeeded here was that they brought pressure off the edge with Gordon. Michigan showed a 3-4 front for a lot of this game and it was really effective. They frequently brought blitzes off the edge and were able to force quick throws or scrambles from Scheelhaase. Part of this is because Michigan was confident that Scheelhaase couldn't beat them through the air consistently. Though I think this is probably Michigan's most effective defensive approach (bring a lot of pressure, mix up looks, and try to get to quarterbacks), against better quarterbacks, Michigan probably won't be so cavalier. In the end, this play wasn't really any different than the same zone coverage they've been showing all year: a four-man front, four underneath defenders, and cover-3. 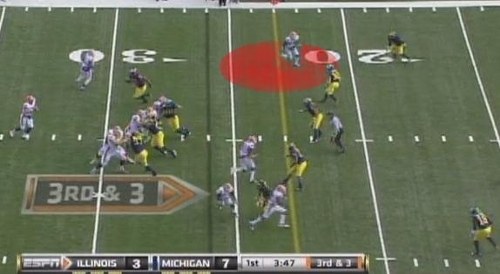 What changed was the pre-snap alignment of Kovacs and Michigan's ability to disguise the coverage. By bringing Kovacs down from a pre-snap safety position, the x-receiver was unable to read the zone and settle into a soft spot. The Gordon blitz confused the Illinois offensive line, and Gordon was able to get into the backfield untouched, forcing a quick throw. Scheelhaase's first read is the x-receiver, but with Kovacs running directly into the passing lane, he's forced to check it down to the flat where Kovacs' momentum will naturally carry him. This just looks like a more competent defense than we've seen all year, and much of it is because of a change in base personnel/formation. The 3-4 front that Michigan showed was really effective in this game and should be Michigan's base defense going forward. It's plays like this and the general success Michigan showed against non-option runs that makes me think this defense isn't completely hopeless and Greg Robinson hasn't already been handed his pink slip. This is a great post Chris, thanks. I picture paged Kovacs' 3rd down stop. Best game in coverage he's had all year thanks to improved positioning.